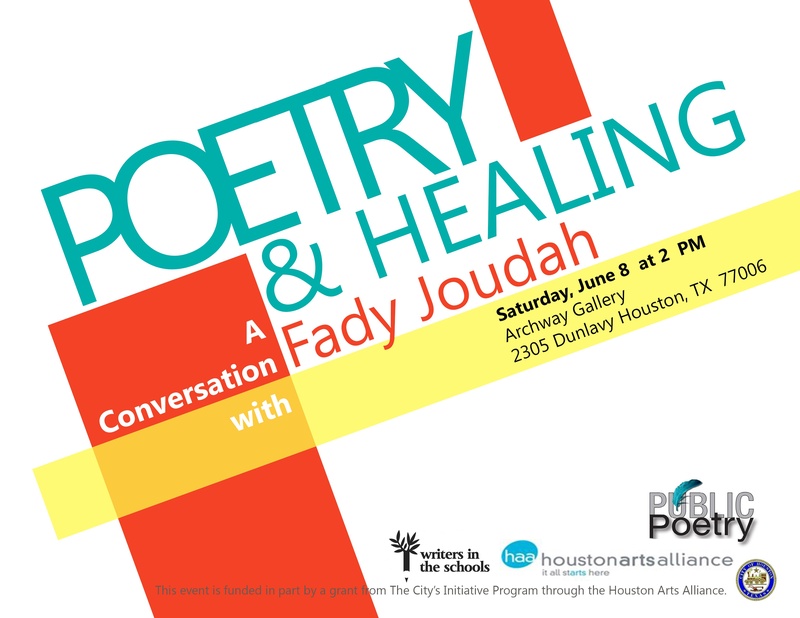 Join us for Fady Joudah’s Poetry and Healing Workshop-Talk, Saturday, June 8th, 2-4 PM at Archway Gallery, 2305 Dunlavy, Houston, TX, 77006. Fady Joudah is a Palestinian American poet, translator and physician of internal medicine. Alight, (Copper Canyon Press, 2013) is his second book of poetry, after The Earth in the Attic which won the Yale Prize for Younger Poets. He is also internationally acclaimed as a translator of the poetry of Mahmoud Darwish, and most recently of Ghassan Zaqtan’s Like a Straw Bird it Follows Me, which is a finalist for the 2013 Griffin Poetry Prize. He has served in the field with Doctors Without Borders.